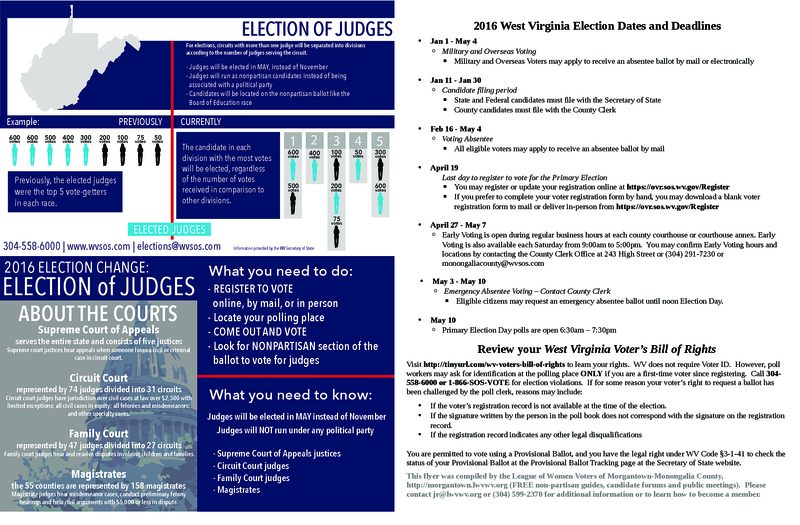 The Monongalia Levy Sage Continues – 6 levies are now on the Ballot! A special meeting was held on February 29 by the Monongalia County Commission. On the agenda was the Youth Baseball and WV Botanic Garden Levy and the Fairs and Festivals Levy. After very interesting discussions each respective levy was approved, with the Youth Baseball and WV Botanic Garden Levy by a ruling. Now there are 6 levies on the May 10 Primary Ballot! Mountain Line Transit, Citizens for Parks and Trails, Monongalia County Volunteer Fireman’s Association, and Morgantown Public Library levies were approved by the county commissioners and will be on the ballot. The Wood County LWV will meet to learn about climate change on Monday, February 22 at the Parkersburg Wood County Library at 7:00 p.m. Guest speaker will be Eric Engle of Mid-Ohio Valley Climate Action. Open to the public. This Voter also Includes status of some bills currently in the WV Legislature and it lists new positions announced by LWVUS on Constitutional Amendments and Constitutional Conventions. League members in Huntington will meet on Feb. 20 to learn about the Public Defender program.